Clinical applications of EUS for the liver have been recently increasing. They include the screening and diagnosis of liver parenchymal disease and malignant tumors as well as EUS-guided interventions such as hepaticogastrostomy, tumor ablation therapy, and portal pressure gradient measurement. Although the segmental localization of the targeted tumor, bile duct, and vessel in the liver is important to complete these procedures, little information is available regarding hepatic segmental anatomy on EUS. 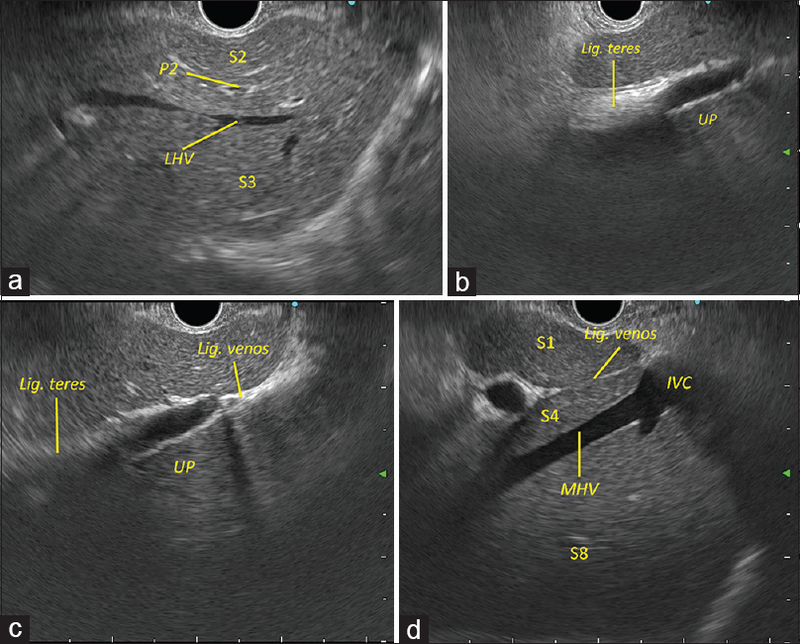 The liver can be visualized with EUS by transgastric and transduodenal scanning, and the EUS determination of segmental location can be achieved using various anatomical landmarks. Identification of the right posterior segments is, however, technically difficult because they are located far from the stomach and duodenum. 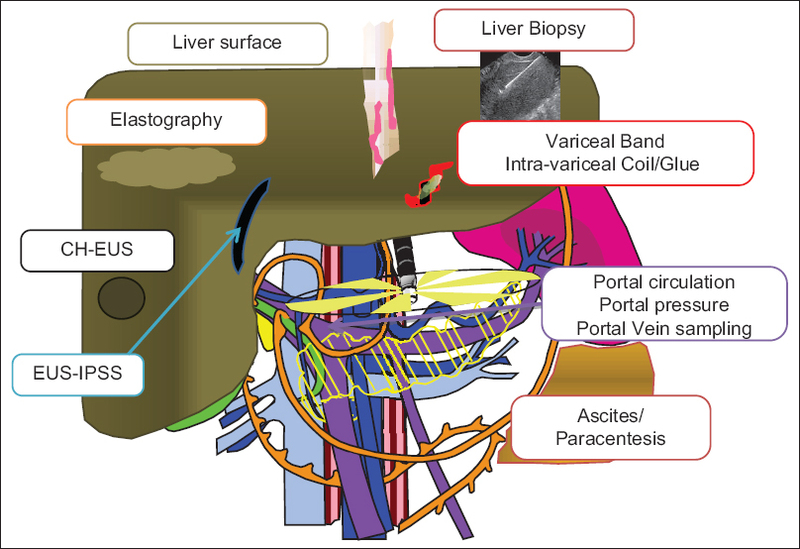 In the present review, we describe the normal anatomy of liver segments using linear EUS. 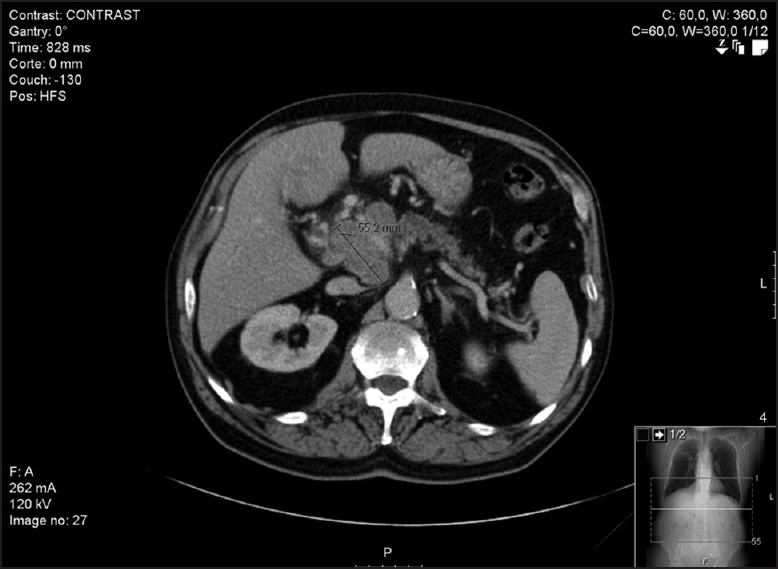 Transabdominal-US is the first-line imaging modality used to assess the whole liver parenchyma and vascularization; EUS assessment of the liver is incomplete and is not sufficient to rule out the presence of focal liver lesions. 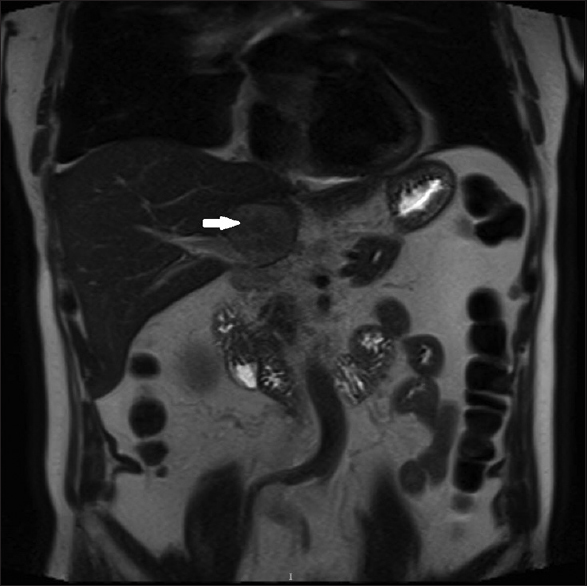 On the other hand, due the high diagnostic yield in detecting very small (< 1 cm) lesions, EUS is considered complementary to radiological imaging techniques for the investigation of liver parenchyma. 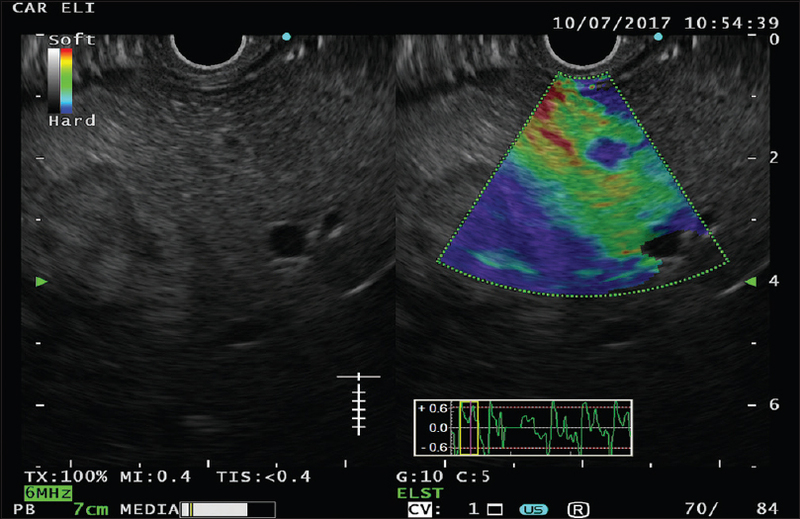 Scarce data are available regarding the investigation of liver parenchyma using both EUS-elastography (EUS-E) and CH-EUS. The aim of this review is to evaluate the clinical role of image enhancement techniques, namely EUS-E and contrast harmonic-EUS (CH-EUS), for the evaluation liver diseases. Despite a potential interest for the application of EUS-E in the assessment of liver diseases, available evidence relegates this technique only to research areas, such as the differential diagnosis between benign and malignant focal liver lesions and the quantification of liver fibrosis in diffuse parenchymal diseases. 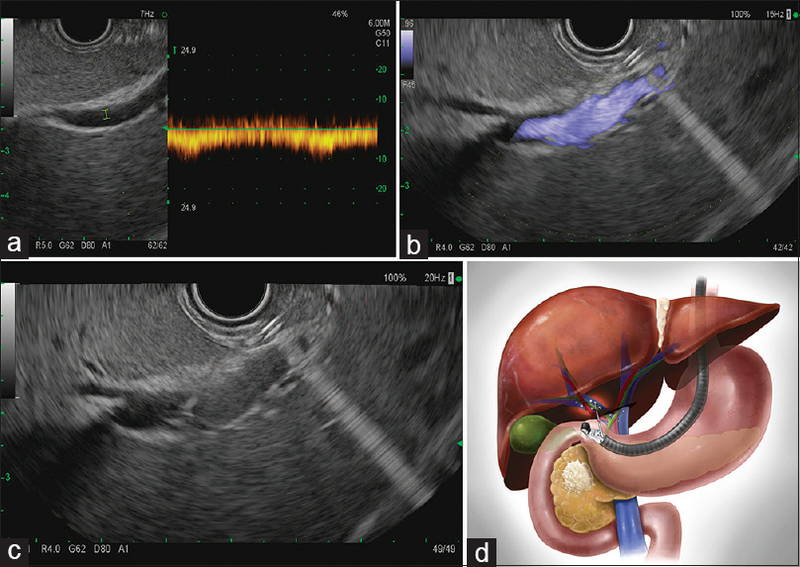 With the future introduction of EUS shear-wave elastography, interesting data can be obtained for the assessment of liver fibrosis during real-time EUS evaluation. The usefulness of CH-EUS for the evaluation of liver disease is limited by the intrinsic EUS ability to explore only the left lobe and a small part of the right lobe. CH-EUS could be used to increase the diagnostic ability of EUS for the detection and characterization of small lesions and for guiding tissue sampling. Targeting EUS-guided treatments with either EUS-E or CH-EUS might represent potential future applications. A growing number of studies have explored EUS-guided vascular catheterization due to the relative proximity of the gastrointestinal tract to the major blood vessels of the mediastinum and abdomen. In particular, EUS-guided access of the portal vein (PV) may be favorable given the relative difficulty of PV access through standard percutaneous routes. 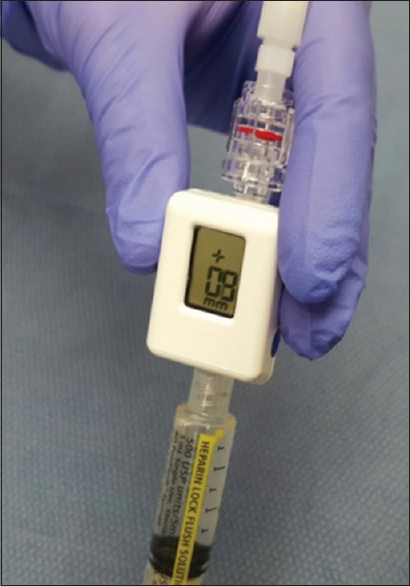 Two major diagnostic applications of EUS-guided vascular access include angiography and assessment of intravascular pressure. This review will outline the different devices and techniques employed to obtain angiographic visualization and/or direct pressure measurements of the portal circulation. Ease of access, safety, and important lessons learned from each approach will be highlighted. Background and Objectives: Acquisition of core tissue on endoscopic ultrasound (EUS)-guided fine-needle aspiration has been regarded as important for establishing an accurate histological diagnosis. Recently, a new 20-gauge histology needle with reverse bevel (ProCore needle) and a 22-gauge needle with 3 novel symmetric heels (Acquire needle) have been developed. The aims of this animal experimental study were to assess the core tissue acquisition (TA) abilities of these new histology needles by comparing them with those of conventional 22-gauge needles and to evaluate the efficacy of suction for these needles. Materials and Methods: Three experienced echoendoscopists performed EUS-guided TA with and without suction using 43 types of needles. The amount of obtained tissue specimens and blood contamination was assessed using a scoring system, and the weight of the obtained tissue specimens was measured using an electronic balance. Results: The mean amount of core tissue score of the Acquire 22-gauge needle or ProCore 20-gauge needle was significantly higher than that of the conventional 22-gauge needles (Acquire 22-gauge needle vs. conventional 22-gauge needles: P = 0.024; ProCore 20-gauge needle vs. conventional 22-gauge needles: P = 0.001). There was no significant difference in the mean amount of core tissue score between the Acquire 22-gauge needle and the ProCore 20-gauge needle (P = 0.296). In the Acquire 22-gauge needle and ProCore 20-gauge needle, there was no significant difference between the mean amount of core tissue score with suction and that without suction (3.7 ± 0.4 vs. 3.5 ± 0.4, P = 0.734) although blood contamination increased (2.3 ± 0.7 vs. 1.6 ± 0.3, P = 0.061). Conclusion: The TA abilities of the ProCore 20-gauge needle and Acquire 22-gauge needle were better than those of the conventional 22-gauge needles. The efficacy of suction for the ProCore 20-gauge needle and Acquire 22-gauge needle was limited. Background: Ectopic pancreas (EP) belongs to the most frequent subepithelial lesions (SELs) of the upper gastrointestinal (GI) tract. In the majority of cases, it is detected incidentally. Differential diagnosis from mesenchymal subepithelial tumors may be difficult. 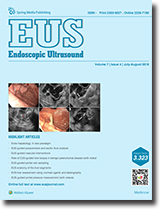 Methods: Among 24,308 endosonographic examinations and interventions, which were prospectively enrolled in the database of the German Endoscopic Ultrasound (EUS) Registry from January 2009 to August 2013, 575 were performed for suspected SELs of the upper GI tract. Sixty three cases of EP of the upper GI tract (stomach, n = 53; duodenum, n = 10; esophagus, n = 0) were extracted and retrospectively reviewed. Results: In 65.1% of cases, radial echoendoscopes or radial miniprobes were used for examination. Nearly 84% of EP was found in the stomach, 16% in the duodenum, none in the esophagus. 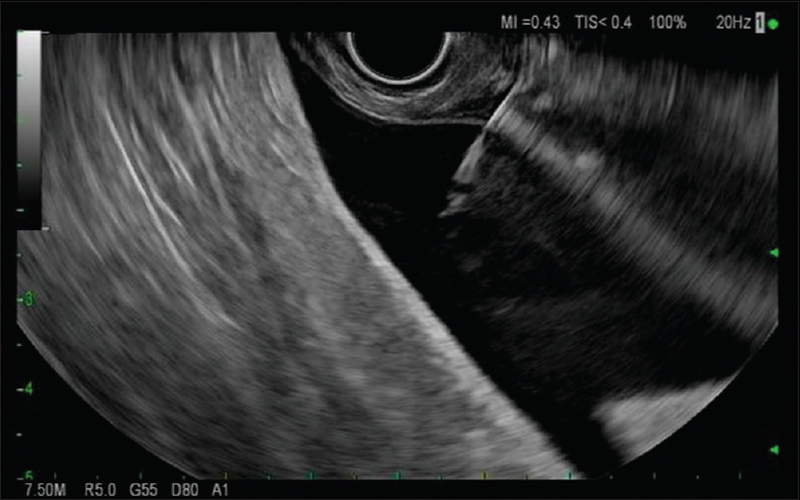 In 88.9% of cases, the EUS examination discerned the layer of origin. 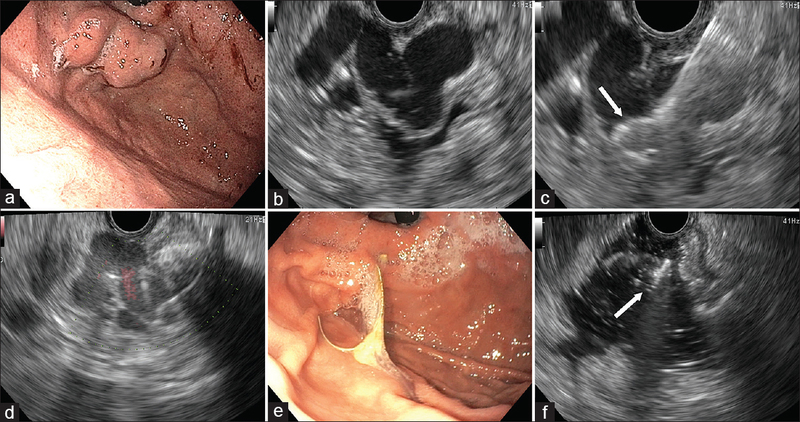 In 59% of cases EP was described as a heterogeneous, in 28.6% as a homogeneous-hypoechoic and in 7.9% as a homogeneous-echogenic subepithelial mass lesion. Mean diameter was 13.0 mm × 8.1 mm, the mean ratio between long and short axis diameter was 1.75. EUS-guided fine needle aspiration (EUS-FNA) was used to accomplish cytological or histological diagnosis in only 6.3% of cases. Conclusions: EP accounts for 11% of all EUS examinations performed for subepithelial lesions of the upper GI tract and prospectively enrolled in the German EUS registry. 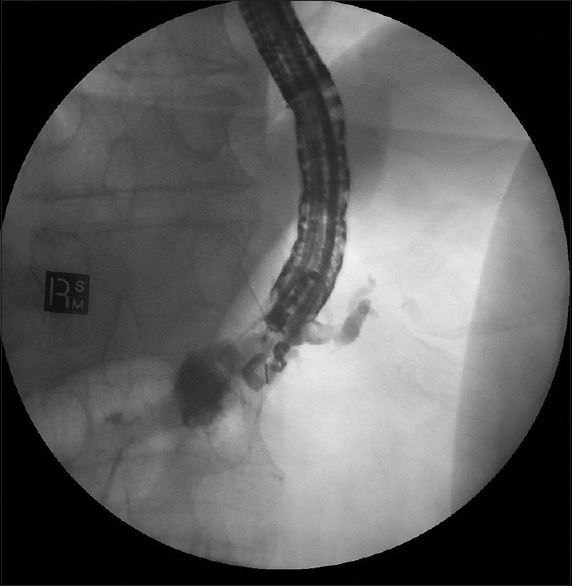 Rather than being an eyecatcher, EP is a chameleon with numerous differential diagnoses. In selected cases, EUS-FNA may help clarifying the diagnosis. Lung cancer is one of the major causes of death in the world. Small cell carcinoma is the most aggressive type and can spread rapidly. 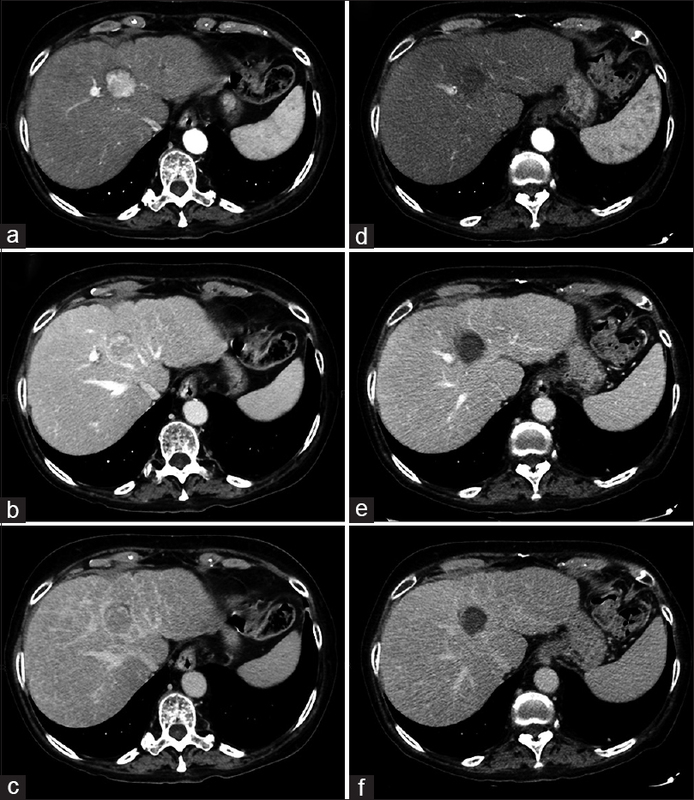 The association of a small cell carcinoma with hepatic hilar metastasis and biliary obstruction is rare. Endoscopic ultrasound allows the aspiration of a cytology sample from adenopathies for diagnostic purpose. We present the case of a patient with lung cancer, with lymph node metastasis to the hepatic hilum and extrinsic biliary tree compression. Endoscopic ultrasound allowed the definitive diagnosis of hepatic hilar metastasis of a lung small cell carcinoma. To the author's knowledge it was the first time that endoscopic ultrasound was used for the diagnosis of hepatic hilar lymph node metastasis of lung cancer.